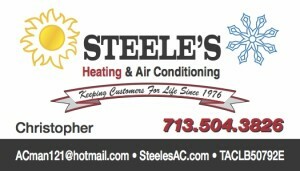 Steele’s Heating and Air Conditioning is commited to saving you money on your electric bill here are a few ways to do this both in your house and with your power company. www.mytruecost.com is a website designed by Centerpoint Energy for customers to be able to compare there rate against rates of other companies in the area. Quite commonly customers are still with a company that has rates up to 18 cents/kw. Rates can be found from 8-12 in most Centerpoint Energy areas. When you navigate to their website click on shop plans, then sort by price for the lowest rates. There are always 100% green companies as well which have a little bit higher rate but provide clean energy. Then using their search engine to find right plan for you click enroll. This will then take you thru the enrollment process of the particular company that you have chosen. Did you know that just changing your air conditioning filter every four to six weeks can save you up to 15 percent on your electricity bill? Use your monthly utility bill as a reminder to clean or replace your filter. We Install Media filters and UV aire systems that help purify the air and last up to six months. Air conditioning accounts for about 60 percent of a typical home’s electric energy use. Set your thermostat at 78 degrees or higher if you’re leaving the house for more than four hours. Never forget with a programmable thermostat. Also learn how to lower this number with a higher SEER rating System. With higher temperature settings, use ceiling fans or portable fans to move air to make the room feel cooler. You’ll stay more comfortable and save energy, too. Turn off lights when the room is not occupied and, whenever possible, convert incandescent light bulbs to compact fluorescent light bulbs. Seal air leaks around doors and windows with caulk and weather-stripping. This will increase indoor comfort, and help reduce both your cooling and heating costs. Use shades or curtains to block the sun and heat during summer and open them in cooler months to take advantage of free solar heat.